Where will Canada's growth come from? The consensus outlook for Canadian economic growth in 2012 is generally tepid, with the possibility of another international financial crisis tipping us into recession as it did in the fall of 2008. After looking over the potential sources of growth, it's easy to see where this consensus came from. One of those data-intensive posts with lots of graphs is below the fold. I don't necessarily have a profound insight, but I think it's useful to look through the numbers in order to get a better idea of where we are and how we got here. Does Christmas Really Create Deadweight Loss? "I want a baby doll and a waterproof [coat] with a hood and a pair of gloves and a toffee apple and a gold penny and a silver sixpence and a long toffee." Annie Howard, Christmas 1911. Apart from any sentimental value of the items, if you did not have them, how much would you be willing to pay to obtain them? The answers to the second question were ten to 30 percent lower than the answers to the first, leading Waldfogel to conclude that Christmas destroys value, and creates a deadweight loss. The Trade Cycle; why I=S is a bad place to start doing macro. In the olden days, economists used to talk about the trade cycle. (They meant a cycle in the amount of all trade, not just international trade). They meant a cycle in the amount of exchange. There are fluctuations over time in the amount of buying and selling that people do. In a boom, trade speeds up; and in a recession, trade slows down. I think we should resurrect that old term. Thinking about the trade cycle is a better way of thinking about short run macroeconomics than how we currently think about it. Nowadays we don't talk about fluctuations in trade; instead we talk about fluctuations in output. It's not the same thing. We are wrong; the old guys were right. Somewhere, maybe around the 1920's or 1930's (I wish I were better at history of thought) macroeconomics took a wrong turn. This post is a follow-up to my previous post. A typical person’s demand for potato chips is given by p=5-q where q=the number of packages of chips purchased, and p is the price of chips in dollars per package. 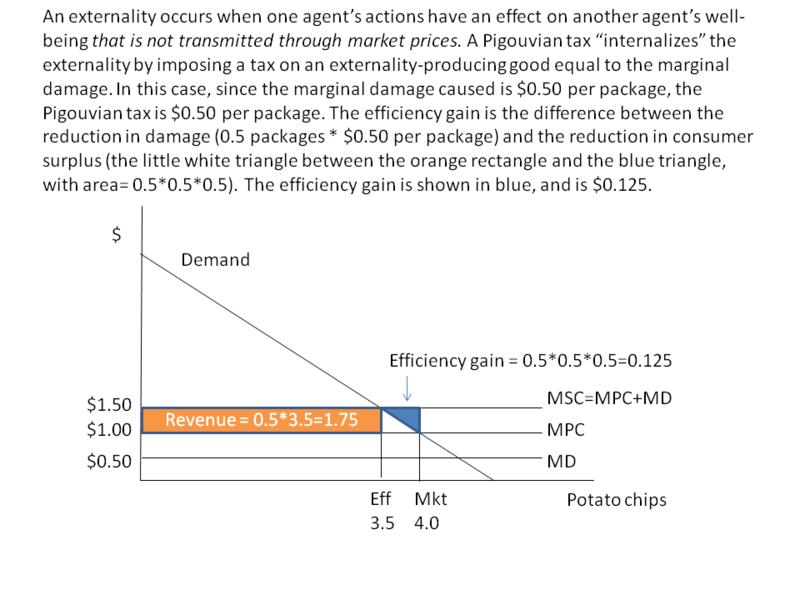 The marginal cost of producing potato chips is $1 per package. The potato chip market is competitive, so p=MC. Dr. Economides estimates that each package of potato chips consumed creates marginal damage of $0.50. Illustrate these facts with a diagram. Show how a Pigouvian tax could be used in this example to improve efficiency. Calculate the revenue raised by the Pigouvian tax. Show on your diagram, and calculate, the efficiency gain created by the tax. Solutions to parts 1 to 4 are here. The interesting part is question 5: if potato chips only harm potato chips eaters, does that strengthen or weaken the case for taxation? Vote here to express your opinion (only the first 200 answers will be counted). Why Y? A disproof of Keynesian macroeconomics? There's something really wrong with the way we do short run macroeconomics. We focus all our attention on the output of newly-produced goods and services. That's what we call "Y". We talk about Aggregate Demand and Aggregate Supply, and what we mean by AD and AS is the demand and supply of those same newly-produced goods and services. Keynesians then go on to divide Y into C+I+G, and C+S+T. Monetarists talk about MV=PY. Both agree that a recession is a fall in Y, caused by a drop in demand for Y. But a moment's reflection tells you this is wrong. It's not just new stuff that is harder to sell in a recession; it's old stuff too. New cars and old cars. New houses and old houses. New paintings and old paintings. New furniture and antique furniture. New machine tools and old machine tools. New land and old land. "News" is the difference between what happens and what you expected to happen. If you have rational, and hence unbiased, expectations, then the news, on average, should be neither good nor bad. The good news and the bad news should cancel out. So why does the news that gets reported seem mostly bad news? Does bad news sell more newspapers than good news? Are newspapers biased? Suppose reality is skewed. The distribution of the news has a zero mean by assumption, if our expectations are unbiased. But suppose the distribution has a long tail on the bad news side, and a short tail on the good news side. And suppose newspapers only report on big news, that's (say) one standard deviation or more away from the mean. Then most of the news reported would be bad news, because there are very few good news stories that are big enough to be worth reporting, just lots and lots of little good news events. "There were no serious accidents today on highway 401" never makes it into the newspapers. But why should reality be skewed? That's the tricky question. But I think I can answer it. I've just come up with a new theory of what caused the recent recession. There was a technological improvement in making gizmos. The productivity of gizmo producers increased, so the price of gizmos fell. The demand for gizmos is price-inelastic. So total revenue from gizmo production fell. So incomes from producing gizmos fell. There are two curves in short run macroeconomics: the AD curve, and the "other" curve. This post is not about the AD curve. It's about that other curve. The other curve is the one that tells us what happens when the AD curve shifts exogenously. The other curve tells us whether a shift in the AD curve will affect real variables or nominal variables or both. Theory tells us that the other curve should be close to vertical in the long run, when AD affects only nominal variables. I'm more interested in that other curve in the short run. In particular, if we put the levels of real variables on the horizontal axis, what belongs on the vertical axis of the other curve? Is it levels, or rates of change? Is it the price level, or the inflation rate? Does it matter? If you are a good student, then a department that will not give you a job because of your "sloppy" appearance does not deserve to have you. If you are mediocre, then there are many other candidates like you and dressing casually is the only way for you to get noticed. These two pieces of fashion advice are not as diametrically opposed as they might seem. Both recognize that clothes act as signals. The question "what not to wear?" is asking what should, or shouldn't, a person be signalling. It is odd how ideas, thought and reading evolve over the course of a day. I started off early this morning reading Nick Rowe’s post on structural deficits in the Eurozone and assorted news stories on the European crisis. I then began working in my office and while shuffling a few books on my desk came across my copy of First Principles of Public Finance (1936) by Antonio De Viti De Marco. The book was given to me a number of years ago by Norman Bonsor at Lakehead when he retired and I had started reading it several weeks ago given that I was looking for something different as I began preparing for next term’s intro lecture for my public finance course. De Marco was part of the “Italian school” and had a focus on institutions and political economy that made him (and I suppose the Italian School) a precursor to public choice. As Europe struggles with its fiscal crisis and trying to rein in deficits, it may be instructive to consider a few passages from De Marco’s First Principles to gain some perspective on the European fiscal mind. Two recent papers on top-earner taxation have made an important contribution to the policy debate on the topic, but it seems to me that we still have some way to go before we have an understanding of the phenomenon that is robust enough to use as a basis for policy.